1. Make a list of familiar topics – English, baby!’s daily lessons are great examples. Practice planning and writing an essay for each topic. First, think of one main idea or opinion for each topic and then think of a few points that support this idea or opinion. When you first start practicing this, take at least forty-five minutes to plan, write and check each essay. Once you improve, you should be able to do this in half an hour or less. 2. Write out every word in full – never use abbreviations! Although you may want to save time, abbreviations such as u instead of you are not acceptable for TOEFL® writing. Save these abbreviations for the English, baby! chat room. 3. Keep your sentences simple. Only use big words and complicated language if you know how to use them! Although it looks impressive to show your command of English, if you make grammatical mistakes or misuse complicated words it can actually lower your score. 4. Make sure your essay has structure with a strong introduction, body paragraphs and conclusion that unify your thoughts. 5. 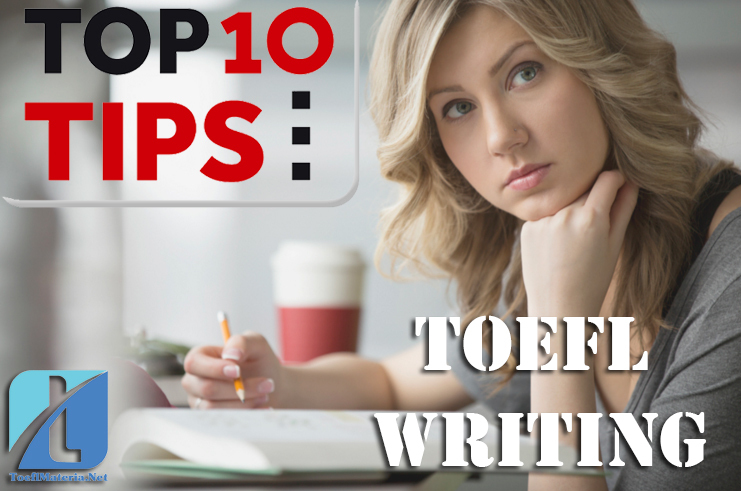 Do not try to write too much – most TOEFL iBT® essays are four to five paragraphs. If you try to write more than this, you will have less time to check for errors or properly plan your responses. Writing too much in a hurry also increases your chances of making mistakes. 6. Become confident with paraphrasing. Read essays, daily lessons on English, baby! and newspaper articles and practice writing what you have read in your own words (this is paraphrasing). You will receive a score of zero if you simply copy words from the reading passage. 7. Take your time to make sure you completely understand the question – you don’t want to rush into the essay only to find out halfway through that you have misunderstood it and have to start all over again. 8. Give details and examples to support your opinions – support your statements with reasons explaining why you feel this way. Increase your vocabulary and learn their synonyms, rather than using the same words again and again. 9. Use tenses appropriately. For facts and observations, use present tense. For example, “sun screen is essential if you are going to be out in the sun” or “I think that everyone should be tolerant of other cultures.” When describing past experiences, use past tense. For example “When I was a child, I loved to play outside.” For more help on tenses and grammar, visit our grammar section. 10. Write in English every day. Write in a diary, get involved in an English, baby! forum, find friends to write to on English, baby! and get involved in English, baby! chats. The more comfortable you are with writing in English, the better your essays will be, as your ideas will flow more easily and you will have a greater vocabulary on a variety of topics.